Michael Skinner's Impromptu Cups & Balls is one of the unpublished gems that he taught to a select few students. The routine was performed on The Tonight Show, June 1, 1973 when Michael was in the prime of his career. Clips of the performance have been around on YouTube on and off for several years, but only a few people knew the complete work for the routine. Some have tried to duplicate it, but missed because they didn't understand Michael's subtleties and timing, especially his startling "Scatter Phase" where the 3 balls start out under the center cup and in a brief moment each ball appears under a separate cup. Steve Pellegrino was fortunate to have been living in Las Vegas in the 1970's and 1980's and got to know Michael, watch him perform and learn from him. With over 25 years of experience with this routine, Steve has now published it for the first time allowing you to easily learn, with all of the subtleties that make it a memorable routine, worthy of appearing on network television. This is being offered to the magic community not only as a tribute to Micheal Skinner, also so that this gem won't become lost to future generations of magicians, as has happened to the works of other magicians from the past. Easy and logical final load sequence. If final loads make you nervous, you will find Michael's sequence easy to do. 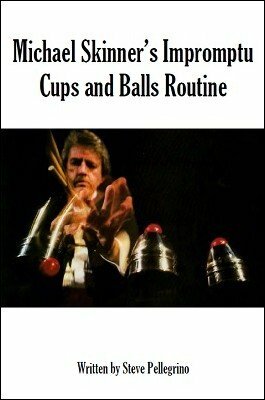 This ebook has over 25 photos detailing the movement of the balls through the routine's five phases. Clear coffee cups were used so the confusion of learning the routine has been eliminated. 1st edition 2013, 37 pages.